There is a lot of discussion, and projects, about developing solutions that address people being able to engage with HyperLocal information. In fact, the project names speak for themselves: UpYourStreet, EveryBlock, etc. Having lived primarily in the suburbs or small towns that have a less diverse, or at least small scale distinctly diverse, culture to them, I could understand, but not relate, to this concept. From my background, one block was nominally the same as the next, there was little direct difference between them and granularity was limited to the "area of the city". But having lived the last month in San Francisco, and more directly, in the Tenderloin, I learned very intimately about this concept - but also think it falls short and is potentially too expansive in it's area. The Tenderloin has a reputation for being rough and tumble, or edgy. What this translates to is that the various streets and alleys are filled with vagrants and drug abusers. The Tenderloin purportedly gets it's name from cops that worked the area and would take bribes for shady deals - and as a result they could afford better cuts of meat from the butcher. 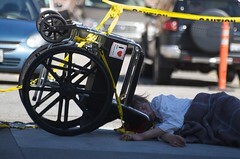 The on the ground reality is that the Tenderloin looked at as a single entity has shady aspects. However, it very much depends on which street - and even which part of the street, side, and facing direction. From the apartment I lived in, one chose their routes based on time of day. Heading east and north were through safe streets, past hotels and restaurants - but south and west were past shady dealers, well frequented liquor stores, and generally unsafe situations. Looking out from from my apartment I could see 270 degrees - to the north was a Hilton, the west was a church, and south were liquor stores and constant groups of impoverished and drug abusers. Across the street from the Hilton on the south side is a Cuban Restaurant and a shop selling X-rated videos, and to the west is a upper-end wine store and chic Vietnamese-Fusion restaurant. This is just a single viewpoint in one area of the neighborhood, but summarizes the general topology of the Tenderloin. This was most succinctly demonstrated right outside my window. I overlooked the Glide Memorial Church, on the corner of Taylor and Ellis - a gorgeous building that made my view one of the best in the area. Glide is renowned for it's Sunday 'Celebrations' that are more like group concerts than church services. 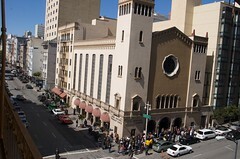 The services are so well attended, a line starts 30 minutes before the doors open, lining up along Taylor heading north. Glide also serves a vital service to the community in providing meals and shelter for vagrants. The line for people to line up to receive meal tickets, or to head in for the night, lines up along Ellis heading west. So at 11AM on a Sunday morning I would look out my window and see from a single perspective two very different worlds, on one corner you had low, middle, and upper class families from the city, as well as tourists and visitors waiting to attend services - and on the other corner was a mirror reflection of low and impoverished people lining up for food. The Tenderloin was always full of surprises. 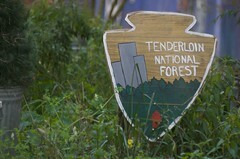 One morning on an expedition from the east corner of the Tenderloin, to the far west end heading to the Scone Factory, Corrie and I were astonished to stumble across a true hidden gem: The Tenderloin National Forest, tucked into Copland alley. While the various neighborhood projects are doing great work, as Steven Johnson points out it's also difficult to provide a nationwide interface to what are very local issues and perspective. So local that if you geocode to the wrong side of the street or around a corner, you have completely changed the context of that information. Fortunately, there is a project underway to enable the community map the neighborhood. In a small area that has such variety and required local knowledge, it is vital for them to mark viable business and residential areas in order to encourage development. I think projects like this are vital to fill-out the localized aggregation services and provide a truly super-hyper-local perspective.